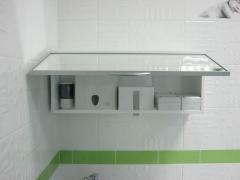 The furniture is made of sheet steel by thickness 1-1,5mm., it is painted by powder enamel in compliance with RAL. 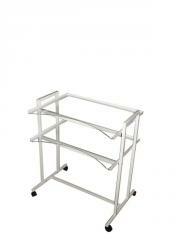 The table-top is made of stainless steel 40 mm thick. The set of furniture consists from: sink curbstones (the ceramics, the mixer touch, a door with a bucket opens a knee), two curbstones with five boxes, a bactericidal case for storage of the sterile tool, a mobile curbstone of the doctor, a dispenser distributor of disposable objects, a case of the first-aid kit, a case with the glass shelf. Length of furniture is 2500 mm., depth is 540 mm., height is 890 mm. 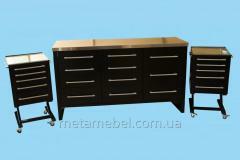 Unbelievable price on Set of furniture medical for the medical hall in Kharkov (Ukraine) company MetaMebel.